← Tiny House On EBay! 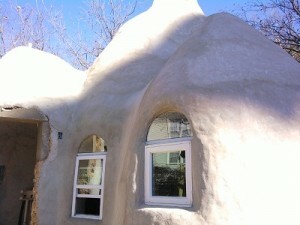 Over the weekend, I went and attended the Earthbag House open house here in Austin. The builders have been working on it since December 2008. They have the exterior finished and will be working on the rammed earth floor next. Watching their briefing was an interesting dynamic. One of the two builders clearly was more of a planner kind of person and lamented the fact that they hadn’t planned ahead for expansion or using alternate cooling methods. The other builder seemed to be the type that just likes to dive in and get things done. He did admit that if they were doing it again he would have added in something more like a Roman cooling system. The plans from Cal-Earth that they’re working from are designed for the desert climate. There, you have a significant temperature drop in the evenings which allow the day’s heat gain to be dissipated out. Here in Texas, it only drops 10-20 degrees in the evenings during the summer so once the house gets hot, it will stay hot. So those plans weren’t designed to be used in Texas. Cal-Earth didn’t mention that fact nor that the plans they bought would have to be stamped again by a licensed architect/engineer in Texas. Turns out that not only were they not supposed to use those plans but those plans were for educational purposes, not actual building. Fortunately, by the time the city discovered the plans weren’t legal, they were already being built and so a quick engineering approval got them through the process. It’s one thing to see the plan on the computer (they used a variation of the Double Eco-Dome). It’s another to be able to walk through it. The center rooms were spacious and the high ceilings gave a nice homey feel. I don’t see how the bubble alcoves are going to work for bedrooms though. Maybe that’s why they’re labeled bedroom-niche on the eco-dome floor plan. To walk inside one, you feel there is a lot more space above your head than around you. I’m not sure even a twin bed would fit in one. They’ll definitely fit a half bath though. I took a picture of one of the bubble alcoves but I couldn’t really get a good angle on it. It’s kind of like walking into an elevator with enough room to move to the side and then turn around and wait to get out. One of the builders said this plan was originally designed as a UN disaster relief plan so there was a big community room and small alcoves where individuals could have privacy too. To rectify the cooling issue, they build box windows onto the roof. 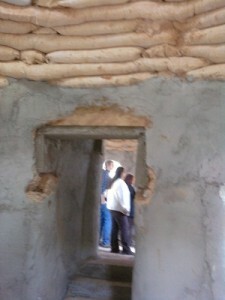 Those windows can be opened with a long pole to allow heat to escape. They also plan to install window AC units. You’ll probably also notice the bags are two different colors. I didn’t hear the explanation but I did hear them say the bags from Cal-Earth had evidently been left out in the sun prior to purchasing them and weren’t any good. They had to drive the roll all the way back to return it. One building feature was that they had the mixture be wet like cement when they packed the bags. Because of that, they didn’t need to tamp anything down. Also because of that, the ceiling began to slide toward the middle as they went up and workers were forced to use rebar to reinforce the angle. We’re not in a seismic region here so they opted not to use barbed wire. Another planning issue was the doorways. To meet code here in Austin, they need 6’8″ rectangular passageways. The arches weren’t tall enough so he went back, knocked the top of them out and set concrete in them. He couldn’t build arches that tall because then you get into doors that don’t fit the slope. One solution would have to been to build out the arches like buttresses as you’d see on an igloo. Another interesting note was that they used a dirt/clay mixture from nearby Elgin that’s typically used for baseball infields. It would have just been too much trouble to filter through the riverbed type of soil they have there already. The name of that company in Elgin is Fenske and their number is 512-285-2561. In looking them up, I didn’t find a website but they do have a review on City Search saying it’s a good product at a fair price but that the owner is rude. All in all, I’m very glad that someone put in the effort to build one of these. As we keep pooling our resources and learning together, we’ll keep coming up with better and better options. The folks at Earthbag House plan to offer workshops in the future. Join their list to be updated. They also have additional pictures on their website. 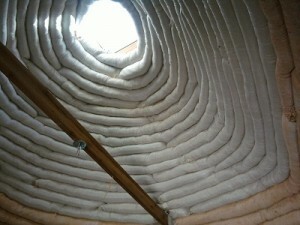 This entry was posted in Building Techniques, Philosophy, Planning, Regulation, Supplies and tagged earthbag house. Bookmark the permalink. hi! i love your house! my husband an i will be building a eb house in may or so. it will only be us two, so what i was wondering was if you know any builders to help us knock out the house quicker. we are very committed to the eb house and would love to get into it as soon as we can. but as you know things will go alot smoother if we have help. any info will help greatly! Melissa, this was just a review of an EB house I toured in Austin. Follow the link at the beginning of this article to get the contact info for the owners.